I have set these shoes aside for shorter runs and/or non-running activities. Somehow, these shoes strain my calves on longer runs, but they are still cute and good for other activities. I DO engage in other activities, right? 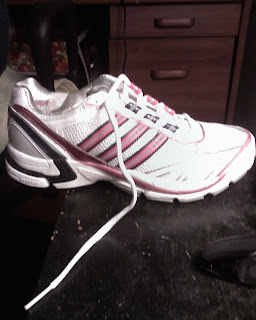 Following my sister Tea Time's footsteps, I got a pair of these Adidas Supernova Sequence 2 in the color seen above. I really like how cushiony they feel and that they are relatively cheaper than other running shoes ($99.99 retail, but I got mine cheaper online). I've always wanted to try Adidas, but they always came in "third" in the recommendations from the running store. So far, I think these shoes are great and did I mention cushiony? I have yet to find a "perfect" running shoe, so I hope this is it so I can just keep buying the same pair online forever. Above: P.S. This is the first picture I've posted taken from my new camera... though I took down the image quality quite a bit so it wouldn't take up so much server space.